On 14 June 2004, after much talking about visiting the Iowa-class Battleship USS New Jersey, I finally paid her a visit. It was an experience that words cannot describe. I was in utter awe of the mere size of her. Even for someone who could recite the dimensions of some of the popular ships that served in WW2, seeing the ship in person was a whole other experience. The USS New Jersey is now, as you can see, a decommissioned ship re-fitted as a floating museum. It is currently moored in Camden, NJ, United States, right across the state lines from Philadelphia. To see a little more about the history of this ship, please click here. Through this article, some thumbnail photographs are inserted to provide some visuals; for their full size counterparts, as well as additional photographs from this trip, please scroll near the bottom of this article. I parked my car about two blocks away from the ship that day, purposedly wanting to walk thru the riverside park and approach her slowly. At two blocks away, I could clearly see her beautiful lines, but I had appreciation of her immense size at that point. In the photograph gallery linked at the end of this article, there is a photograph I took from the bridge window looking forward. Even at the point I do not think I realized from where I was standing to the forward most point of the bow it was more than the length of an American football field. As I walked up to the ticket window, I was only 5 minutes late to a tour that just started. I paid my fees, and a gentleman led me into the ship where the tour had just started. This gentleman, along with the tour guide and many other workers at the USS New Jersey, was a US military veteran. They were all very enthusiastic in telling their stories. This is one of many reasons I would like to revisit the battleship again; I was so awed by the ship itself that I had missed the chance to speak to the veterans to learn of their experiences. I joined with the already-departed group a few minutes into the tour as the group walked along the exterior deck of the ship. The tour guide stopped the group to talk a little bit about the ship's main guns. Her main guns were 16 inches in diameter. If that number did not impress me, seeing a shell used for that weapon sure did. Even dating back to the 1940s, the battleship could deliver these shells, each as tall as a man, relatively accurately against a target 20 miles away. The sheer noise of these shells flying overhead must be most frightening, let alone the thunder of the rifled guns roared by the size powder bags required to fire each shell. Inside the turret, I had the opportunity to look at the other end of each of the primary guns. The words "REPEAT" was written above the shell loading bay. After asking the tour guide, I found that the forward turret was affectionately named Pete, the middle turret Repeat, and the aft turret Ditto. 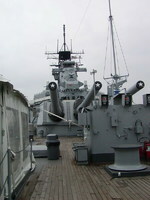 In addition to the primary guns, many secondary gun turrets were also seen along the two sides of the ship. 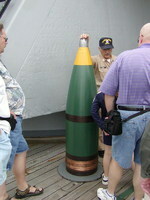 The secondary guns measured 5 inches across in diameter. More modern weapons gave hint to New Jersey's service in more modern conflicts. Tubular missile launchers such as the one shown here housed the likes of AGM-84 Harpoons, which were anti-ship cruise missiles. For targets further inland, she was also equipped with much larger launchers that typically housed BGM-109 Tomahawk cruise missiles when she was on active duty. During Operation Desert Storm, Tomahawk missiles from New Jersey rained down on targets in Baghdad and elsewhere in Iraq. These larger missile launchers were installed so that the port-side launchers would fire toward starboard and vice versa; it was done so that the heat generated by missile launches would be directed toward the ocean. This layout was adopted after seeing the extreme heat damaging deck surfaces. Defensively, she was also equipped with several radar-guided 20mm gatling guns that made up the Mk 15 Phalanx Close In Weapons System ("CIWS"). The CIWS was designed to be a last line of defense system that intercepted missiles that had gotten too close. CIWS featured two separate radars (search and track) and guns that fired 3,000 or 4,500 rounds per minute. Chaff and incendiary launchers could also been seen around the ship, with their contents designed to confuse incoming missiles; they were part of the Mk 36 Super Rapid Bloom Offboard Countermeasures (SRBOC) Chaff and Decoy Launching System. Heading into the interior of the ship, we were also given a tour of the tactical control room where officers monitored status of primary guns and paths of cruise missiles, the bridge, the chart room, bunk quarters, and the mess. The bunks were stacked several-high, which really proved to me that a life at sea certainly is not for the claustrophobic. The tour ended at the mess; although no one works at the mess anymore, the museum maintained the menu served on the last day of the battleship's service. Seeing the menu was strangely eerie. After the guided tour ends, visitors were allowed to roam the public sections of New Jersey. I highly recommend visitors to spend some more time aboard the ship. The design of the superstructure, for example, was worth a second look. Had I not taken the time to check out the ship further, I would have missed the Mk 38 Gun Directors mounted on the side of the main turrets. Below you will find all the photographs I had taken aboard New Jersey. I would like to express special thanks to Rodetripn from the History Channel Discussions boards and Robert S. Zeigler for sharing with WW2DB.com their knowledge on battleship New Jersey's various systems. My father-in-law, Tony Iacono, was part of the original crew that commissioned this ship in 1943. Three years of his life were spent aboard her. 11 invasions., from the Marshalls to Okinawa. I was fortunate enough to visit her in 1968 and again in 1982. A great ship. My father, Carl De Nobrega was a Plank owner on the Jersey. He was a Machinist Mate first class Petty Officer. He was in many of the battles, including Truck etc. He was aboard during the storm that sank one or two other ships. I would like to know how I can enter some information and have my father entered in the ships history. He served her well and it would be a piece of history to know a little about one of her first crew members during and after the war. How can I go about this?